For Violet Eden the decisions between right and wrong are getting harder and harder. You’d think as a half-angel Grigori warrior, she’d automatically be on the side of good. But how can she choose between the life of her best friend and the lives of all Grigori? Between the soul-crushing need for her training partner Lincoln and her desire to keep him safe at all costs? And what if the darkest exiled angel of all, Phoenix, isn’t as bad as she thought? With the power to raise a being from the Underworld in her hands, Violet only has one chance to make the right choice. It had been quite some time since i had last read this series, and i think that it may have been a slight injustice, however i picked up pretty quickly. We are quickly brought up to speed now that we know that the Grigori have the Exile Scripture and Phoenix and the exiles have the Grigori Scripture. Everyones trying to get their hands on the other and make a trade so they can either keep the names of those humans that are to embrace and become angels will safe (for the part of the Grigori) or for Phoenix to raise Lillith from Hell in getting his hands on his own scripture. Throughout this story we continue to see the pull that Phoenix has on Vi and it’s really hard for her given that she actually does hate him….but he hast his control over her. This of course makes her relationship with Lincoln that much harder since they now both know what will happen if they let their souls join and something happens to one of them. In any event, this third installment takes us on a similar journey that book 2 did. We’re off to a foreign country in search for answers, and hoping that the Grigori can out power Phoenix and the exiles. Steph continues to play a strong role in all of this which is interesting given that she’s a human. she actually becomes a pawn at one point in time which makes things all that more complicated. The grigori from the Academy come back and a few new folks join them, which isn’t so welcome since we meet Josephine – the Vice (or #2) who clearly has her own motivations when it comes to Violet. Interestingly enough, Violet’s father steps up a bit during this book which is quite the unwelcome time. He grows suspicious finally and tries to lay down some ground rules which by this point Violet can’t live by and that makes things more complicated. Through this third book, we see Violet grow up a bit and come to terms a bit more with her making, through the help of her angel maker’s appearance as well as her angel guides. they of course make things more confusing for her in riddles, but that’s what they do. Towards the end we see an interesting shift in things – while we hope that things will work out, we know that it’s destined not to and that’s what happens. I love how the dynamic between Vi and Linc continues to keep us on edge, and i can’t wait to jump into book 4. Also – we get a real surprise at the end – while i was expecting half of it, i was not expecting the rest so it’ll really be exciting to see where it continues in the next installment. Enjoy everyone! 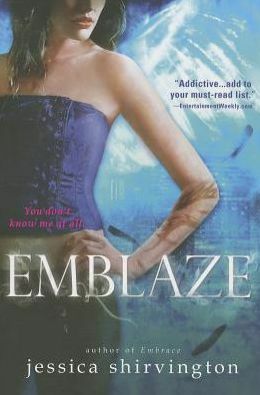 This entry was posted in fantasy, Reviews, Young Adult and tagged Angels, Emblaze, fantasy, Jessica Shirvington, The Violet Eden Chapters by iscm13. Bookmark the permalink.